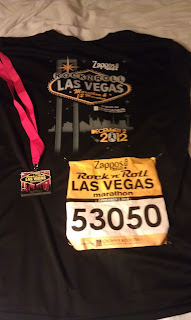 This was my fourth running of the Las Vegas Marathon. The weather was warm -- 72F with some wind blowing anywhere from 20 - 30 mph. This is unlike previous years where the weather was chilly or even damp. It was blowing from the south, so right off, I knew it was going to help us on the way out of town and pound us on the way back. Prior to the race start, I felt pretty good -- no bloating, no soreness and I was ready to run. I had done my work beforehand, putting in some decent 20 mile runs. I wore a camelback with about 30 ounces of Powerade in it. I'd need every drop by the end of the race... it was so dry and warm. I also stopped and grabbed water / Gatorade at every water stop during the race. I guess I go through fluids pretty quickly. I wound up using 4 gels during the race as well. I started out running 8:30's / 8:40's without any problems within 5 minutes of race start. The start was a little underwhelming (no hoopla like in previous years) There were lots of people and the first mile or two involved a little bit of weaving , but by mile 3, I was running my own race at my own pace. 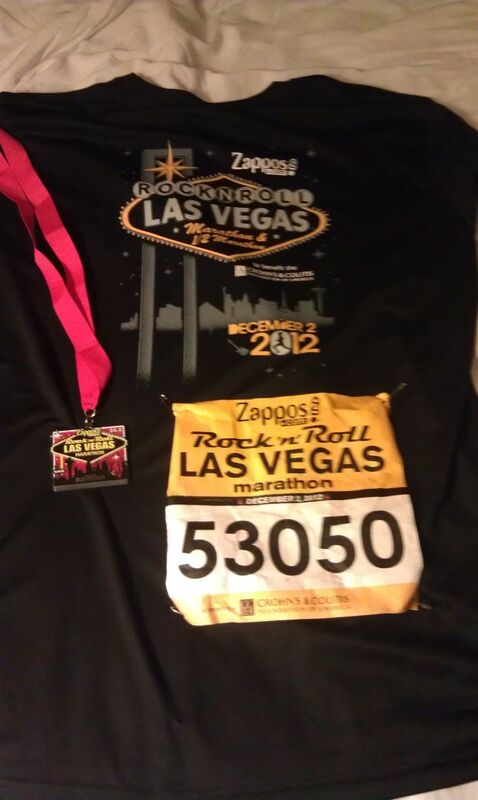 It was really rewarding and empowering running down the Las Vegas strip with crowds of people lining the roads. I loved this year's route. The strip was the best part to run on and we took some routes through the northern section of the city. It is notoriously a bad area (lots of crime / seedy neighborhoods) but I was surprised at some of the sites. I love being able to see the city lights out in the distance when we got to North Las Vegas's airport. In short, I was pleasantly surprised by the route. I crossed the halfway point at 1:56, slower than planned and slower than my Layton marathon that I had done about 2 months prior. I was still feeling good. Although I was warm, I was on a decent pace and felt controlled. Miles 14 - 18 were tough. It was into the wind and slightly uphill. I think my pace slipped to the mid 9's despite still feeling good and feeling like I was running 8:30's. The downhill from 18 - 20 was good and I picked up my pace again. Although at mile 20 my right leg / foot / hip started to go numb. Not sure what was going on, but it was disconcerting. Made a pit stop at mile 20 which cost me about 45 seconds. Got renergized running down the middle of Freemont street. They had it closed off to the runners and the crowds were there for us. What was nice is that the halfer's didn't have that experience -- it was reserved solely for marathoners. Awesome! I had always hoped that they would do this as in the past we only got a glimpse of the true Freemont Street, but this year we got to run right through the heart of it. It was also here that the crowd support resumed. Last year we had problems with the halfers crowding everybody out, but I want to say the organizers this year did a great job. Only the last 1.5 miles were side-by-side with the halfers and they were respectful in staying in their lanes. I think I only had one problem when some of them were going to our water stop (I think their water stop was out of fluids) so their actions were completely reasonable. Either way, I was able to maintain my current pace without weaving through the final group of half marathon runners. The last 4 miles were a test of character as I ran into the wind. My leg was still numb, I was out of Powerade but I was still passing people. Sure, I wanted the race to be done, but I also knew I wanted to finish strong. I saw a lot of people puking or walking but I was still running.... even outgunning some of the halfers next to me. I finished in 4:07:57 or something. I was not happy with my time, but happy I finished. I truly hoped I'd get a 3:45 or so and definitely under 4 hours. Most people's times appeared slower and it is always hard to judge what my time "would've" been had there not been any wind. At mile 22 I was at 3:22, so I think the wind took a lot out of me. Course seemed long... My Garmin showed that I had run an extra quarter mile, finishing in at 26.5 miles or so. Either way, a marathon finish is a finish none the less.